Editor’s Note: Kirk H. covers the off-day with an interesting thought on how the game would be different if the rules changed the way he described. As I watched the Braves fail to push runners across yet again, an idea occurred to me: what if baseball’s scoring rules had evolved such that a point was scored for every base that a runner reaches? How would the game be different? Would it be more or less interesting? More or less exciting? From a pitching standpoint, strikeouts would be king, walks poison. Flyballs would generally be better than ground balls as long as you could keep it in the park. From a batting standpoint, striking out would be a terrible failure. Putting the ball in play would be highly valued, not making outs would be a premium skill. Power is still important since you can score multiple points in an at bat. Speed would be incredibly valuable, both in the ability to take the extra base and steal bases. Intentional walks would be mostly a thing of the past. Only the weakest of hitters would be bunting usually (since a sacrifice is not any more valuable than a fielder’s choice), but pitchers would have to be adept. Defensive over shifts would become extinct since there would be even more incentive for batters to take advantage of the open side of the field to get easy points. Games would be more high scoring, but wouldn’t be longer. About the only downside I see is that the defense is incented to take an out wherever they can get it, pretty much regardless of the situation. This means more routine plays and less chances taken, so some excitement is removed. On balance though, I think I like it. What do you think? -Gohara goes back to AAA for a little while upon return. -We probably don’t buy a big 3B at the deadline. -We probably add a reliever and/or bench piece at the deadline. Every answer to every question he addressed is Classic Braves Not Trying to Win. How would you recommend the Braves be able to draft Joey Bart if he is taken before the Braves’ pick? In fact, if the Braves Were Not Trying to Win, they would have lost enough games last year to have gotten the pick necessary to draft Bart. Bad take. I agree with Chief on that and his logic is incredibly bad. He acts like getting a Moustakas (or Machado or Donaldson) would eliminate the possibility of having Riley take over the position next year or signing a big FA over the winter when the ideas are definitely mutually exclusive. Not to mention that he seems to think getting a deadline 3B would cost an arm and a leg when it’s being made clear that they really won’t cost much – especially Moustakas. I understand we’d like to have a big RH bat but I’d rather have a big LH bat if that’s the best we can get and sometimes a hitter can actually hit both handed pitchers (shock!). I agree with that scout who said, when you’re winning, you take advantage of that any time you can. Just win, baby. The Braves are really set up up to do it all. They have enough pieces that they can make a deadline deal without breaking the bank. They have enough payroll overhead that they can sign a big FA over the winter. They have enough talent on the farm that they can make a blockbuster deal over the winter. Why not do it all???? Taking the path that Bowman is suggesting is just lazy and incompetent. I did laugh out loud when this happened. Stumbled upon a really good write-up on Mark DeRosa. I’m a big fan of the author, so that helps. I don’t care about Bart or college catchers. I was referring to trading for Darren O’Day and calling it a day. with regards to the actual article, I certainly understand the appeal of making rules changes so that teams don’t line up with 8 Rob Deers or Adam Dunns in a row. A lot of baseball lore and legend has to do with things other than Ks and HRs like steals and squeeze bunts and inside the park HRs and hit-and-runs. While this idea promotes a lot of what is good about baseball, there would be too much emphasis placed on getting to 1B as a “win”. That devalues the game. Is it right that a Braves team the hits 10 singles beats a team that hits 3 solo HRs? I would suggest a slight modification. Have each base worth it’s number in runs. 1st base = 1, 2nd base = 2, 3rd base = 3, Home = 4. Also why not subtract a run for an error? That would place more of an emphasis on small ball – advancing a runner, bunts, steals. And a bonus for good defense. I looked at performance so far by position over at Fangraphs. The only thing that stood out to me is that the Braves are distinctly lacking at LF and 3B. The only positions where the Braves rank in the 20’s in baseball are those two. It’s possible that LF is still suffering from pre-Acuna stats but Acuna’s defense has been weak. There’s nothing to do except ride it out with him and wait for things to click. 3B is where an infusion of talent could have the biggest impact. And adding a reliever is right as bullpens do wear down. With regards to starters, the best thing to do is press on and periodically skip someone’s start to give some of the youngsters a chance. If someone like Gohara comes on like gangbusters than trade McCarthy. That might save some bucks and get some talent back. Of course, we have to get Soroka back healthy and performing. Michael Mader pitched well in his first start for AAA: 6 IP, 1 R, 0 BB, 3 K. Acquired with Anfernee Seymour for Chevanka, he’s 24. Good outing for Touki: 6IP, 6H, 2ER, 10K-0BB! As to the proposal, they psychological rhythm of baseball is tension and the relief of tension. Your proposal, sound as it is to assessing player’s skills, disrupts the rhythm. Your rhythm is much closer to, nay almost exactly is the rhythm of cricket. Cricket is popular some places. Maybe you should consider watching some cricket and making the comparison. (a) a man on first with two outs is more interesting than a man on third with two outs, since the former has more potential. (b) On singles with a man on second throwing home (normally a pretty low percentage play, but an exciting one) would be almost eliminated, since you do just as well stopping the hitter from taking second on the throw. (c) We don’t reward artists for half-finished works with great potential. Finish the run-creating project and we’ll be impressed. One other thought: with scores in the 3-5 range, a run is really important. But with scores in the 30-40 range, a base-point isn’t that important, so you might see walks increase for guys with power. Intentional walks. I was wondering who was that third base prospect who was better than Riley over twenty years ago, and I realized it must be Andy Marte. Eh, that’s just what Bowman says. As the team mouth piece, he spends more time writing pieces to keep the fans from being upset than actual critical material. The Braves are likely to do something. Maybe it will be what Bowman suggested. Agreed. He just wants to rein people in, and people have obviously been excited about some hot play from the team, so many fans want the Braves to make a blockbuster. I don’t think I’d even give up one of our top 10 prospects or maybe even two of our top 30, so it might be hard to really upgrade the team this year. When we did the Kemp deal, we made our bed. But I don’t think this is some grand indictment on the Braves’ “willingness to win”. That’s silly. Have we received an explanation for why Allard was scratched? He left his last start early after a collision with Ruiz, but some on Twitter thought he might be getting called up. With Gohara on the bereavement list and Soroka on the shelf, maybe he starts one of the doubleheader games? Would think Wisler would make an additional start, though. I bet some research would reveal at least one “AL scout” working for Frank Wren or Dayton Moore who was working in Atlanta when the Braves drafted Riley. The part I put within the stars is just…well something… Are you freaking kidding me? You wouldn’t trade the Braves 25th and 27th prospect for Mike Moustakas if you could? That’s just asinine. I would give up two mid tier guys for Moustakas. Really, any up grade at third makes the bench better. I may be content to roll with the starting pitching, but the lineup and bench can easily be upgraded by one addition. That’s the best lineup in the east! Yeah, you’re right; I take that back. To be honest, I haven’t checked the prospect rankings lately. I would have no problems trading two of the back end of the top 30, and obviously that shouldn’t be an extreme thing to say. It does get more difficult as you talk about 2 within the top 20. Our 20-30 is starting to thin out a little bit. If my eyes do not deceive me, I see us missing a starter in the second game of the doubleheader on Monday and then again on Tuesday. You’ve got Anibal, Sims and Wisler as incumbent options with Soroka and Gohara being unavailable. Anibal went 5/21, so I’d think he’d have to skip a turn to be ready for Monday or Tuesday. Sims and Wisler would be rested. So as I make my first trip to STP this year on Tuesday, I will have either Anibal, Sims or Wisler to enjoy. Sweet. @23 Your barber is aggressive and greedy. That would be a bold trade. While I don’t know some of the prospects KC would get, the trade doesn’t look half bad overall. I gotta believe that Salvy is not available, though. And I’d still rather not trade Allard (so shoot me). Valera seems like he would mitigate the loss of Maitan (or who we thought Maitan should be). The Braves lead MLB with 10 4-star catches. No other team has more than six. Looking at Statcast’s Outs Above Average, Braves outfielders rank fourth with six. Having played just 26 games, Acuna ranks 50th among MLB outfielders with 41 total chances. Yet, he is tied for first with four 4-star catches (catch probability between 26-50%). Inciarte has one 5-star catch and three 4-star catches. Markakis has two 4-star catches. But I’m told defense doesn’t matter. We might decide to “trade” Camargo/Flaherty for Riley sometime this summer. I think that would be a completely reasonable thing to try, and would still check the boxes for “trying to win”. Would anyone be against that? @25, it doesn’t matter in the sense that major league defenders are all pretty damn good and the variance from worst to best at each position is way less important than on the offensive side of the ledger. There’s also the inconvenient truth of UZR being negatively correlated with winning percentage. But you still have the right enjoy great defensively plays, nobody has ever said you can’t. @26 Of course. Part of the underlying assumption in all of this is that Riley is considered. I think I laid out a decent timeline. Camargo gets a shot until mid-June and then Braves evaluate if Riley is ready. Riley gets his shot up through the end of July. If he succeeds, then no trade. If he needs more seasoning then trade for a rental. I also think the Braves need to determine if they do or do not want to push Riley. If they do and they also give Allard a shot, we could have a team with as many as 6 20-21 y.o.’s on it. That might be unprecedented. Talk about Baby Braves!! A little surprising the Red Sox dropped Hanley. He’s been in a slump but has had decent numbers for the year. And you’d think he’d be a good fit for the Braves at third. But then you see a $22 million option for 2019 triggers at 497 PAs. Unlikely the Braves are gonna go for that. @29 No team in their right mind would trade for Hanley and assume his current contract, even if the Red Sox picked up the tab for the entire rest of the 2018 season – due to that vesting player option for $22M. That said, some AL team will probably kick the tires on acquiring Hanley once he’s released. Hanley can go through stretches of hitting well these days, but his defense is bad and he can’t stay healthy. In that respect, he shares a lot in common with Matt Kemp. It’s unlikely he’d be a good fit with the Braves, even on a dirt cheap deal. On a side note – I checked and the Red Sox will have paid Hanley a total of $88M and got 1.2 fWAR, and Sandoval $95M for -1.8 fWAR. If you want to be a genius GM it sure helps to have a massive checkbook to paper over your mistakes. Well, that genius GM, Ben Cherington, got fired not terribly long after handing out those two particular contracts. I have to agree that (barring a collapse over the month of June), if all we do at the deadline is acquire some nominal bullpen help and/or a nominal bench bat, I don’t know how anyone can look at that and see it as anything other than a pathetic capitulation. I further don’t know how anyone could look at that and continue to be at all assured that the front office will do anything whatsoever to improve the club over the offseason. I will note, as a follow-up, that I think the tide is about to turn (if it hasn’t already) in terms of the fan reaction to this sort of hand-sitting. They’ve largely received a free pass from the start of the rebuild to this point (much to my consternation as we’ve gotten later in the process, as you know), but the fans have gotten a taste of winning now. If this team is in contention for a playoff spot at the deadline, the front office does virtually nothing (and trading for a random middle reliever or bench bat would qualify IMO), and this team misses the playoffs, this will be an ugly offseason on the fan reaction front. How that would affect their strategy for the coming offseason would be an interesting question (one that we hopefully don’t have to find out the answer to). Roger, JonathanF, thanks for engaging on the subject. Generally, I want to see the ball put into play. Strike outs and walks are not that interesting, so both are penalized. @8, if all bases are equally valuable, then in most situations (except very late in a close contest), I think it discourages deliberately trading a base for an out unless the batter is totally hopeless. Increasing the value of each base increases the incentives for bunting, and I don’t want to see more of that than I do already. I could be persuaded that crossing home plate awards a one base bonus (so that each runner that makes it all the way around scores five bases). Note that 10 singles may or not beat 3 solo home runs depending on sequencing, even today. Also, subtracting runs for errors is unnecessary since the team making the error is already being heavily penalized. And I sure don’t want to add subjective elements to scoring, its not gymnastics or figure skating. @13, don’t know a whole lot about cricket, but I do know the matches can be interminable, and I don’t want that. Also, I may be wrong, but in cricket I believe you don’t have to try to try to advance unless you think you can do so successfully. Not very appealing to me. I guess the rhythm is changed somewhat, but generally I think this proposal increases tension, since the potential for scoring on any play is increased. The release of tension is the end of the inning. Re: a), the runner on third has already cashed in a large portion of the potential that the runner on first represents. So by that logic, I guess a home run kills interest since all potential on the bases has been removed? Re: b), I think this is the biggest weakness (and I alluded to this in the main post) since the next priority after preventing runners in the first place is to prevent their advance. Re: c) interesting argument, but it presumes the current rule that crossing home plate is the ultimate goal. If the rule changes, the goal changes. Not so sure about IBB. Wouldn’t make sense early in the contest. If the score is close late, don’t think so since the potential for backfire is large. If the score is not close, you want outs not baserunners. Cricket Twenty20 matches last about 3 hours and are a hell of a lot of fun. Matt Wisler called up to take Gohara’s place. Will be interesting to see who starts one of the doubleheader games Monday and who starts Tuesday. I would imagine Wisler starts one of them, probably the Tuesday game with whoever the Braves call up (possibly Fried) as the 26th man starting the doubleheader game. Totally forgot about Fried. He’d be the nice alternative to the list @22. Where’s a good place in downtown Atlanta to watch the game and have a beverage? Anyone see that the Mariners have gotten a high leverage reliever and a CF to replace Dee Gordon who is replacing Cano at 2nd? Paid some money gave up a couple of non-prospects and got some real help to cover holes. That’s the way to do it. Of course, if you’re unwilling to take on payroll then the prospects have to be better. Basically, a similar trade to the Kimbrel trade to get rid of BJs contract. Atlanta got Riley out of that trade, though. And useful pieces in Maybin and Wisler. It’s possible to make big trades without giving up too much. I don’t think Fenway would be a good home park for Julio. Is this an “episode” or just dumb luck? We got three good Julio innings. Not gonna last…..
@38 Perhaps a bit late but here goes: May I suggest (though I have never been there) The Braves All-Star Grill??? Downtown bars where I have watched Braves games: Park Bar, Sidebar, Meehan’s. Those are my picks for what it may be worth at this point. Deep dark depression; excessive misery. If it weren’t for Neck, we’d have no runs at all. Gloom, despair, and agony on meeeeeeee. Dansby is hopeless at the plate right now. Why is Teheran starting the 6th? He doesn’t stink. He’s just got mechanical flaws that he needs to overcome. I thought he had it figured out, but he’s fallen back to bad habits. Nobody on the team has looked great at the plate for the past week and a half. 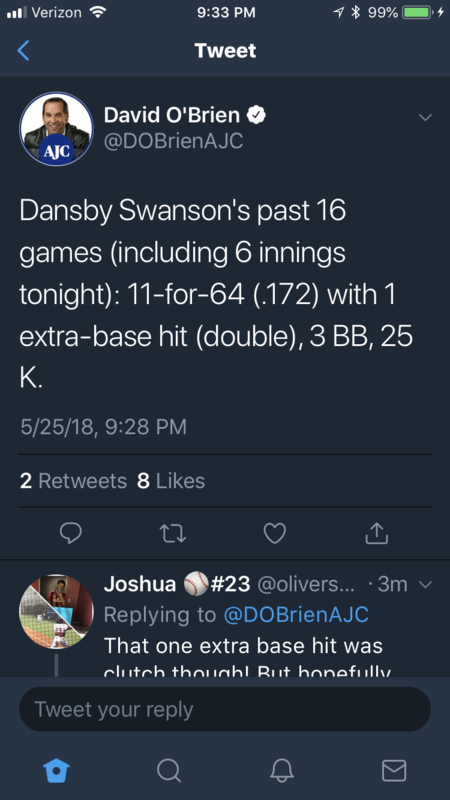 That’s an ugly stretch for Dansby. There certainly seems to be a gap in his talent and performance. Wow, Biddle in in a big spot. They’re literally bringing in Matt Wisler to pitch to the best player in baseball. That’s bold. Dansby is hitting .273/.314/.402 in 132 AB this season. He is hitting .251/.321/.358 in 749 career AB. Either one of those is a better way of looking at him (or anybody) than any 16 game stretch. No more Wisler, no more Lucas Sims, no more Blair when his arm is reattached. Done with these guys they are NO GOOD and never will be. Why is Wisler coming in with runners on, obviously pitching out of the stretch, clears the bases as he tends to do, and then goes to the wind-up? Like, pick a role. Teheran and Wisler are competing to see who can hang the most sliders. There does need to be a level of maturity to understand that when you say Wisler could be a good pitcher, that doesn’t mean he should come in to face Mookie Betts. Doesn’t matter much if we can’t score. Who cares who eats the meaningless innings. Well, I guess with Wisler working hard tonight he won’t be starting Monday or Tuesday. I’m guessing they’ll activate Anibal, even though he was horrid in his rehab start. Oddly, it seems like a slump since we’ve lost 3 of 4, but we’re also 6-4 in our last 10 same as everyone else in the division. Regression. But it sure doesn’t matter if we don’t start hitting again. If Snitker is not willing to shake up the lineup to get folks out of their routines, then we just going to keep sinking at the plate. It really galls me that everyone is griping on Dansby when his last 16 games have not exactly been “in a row” and there was a long DL stretch in there. It might take him a month – the equivalent of Spring Training – to get his mojo back. These kids need to look at how Nick goes about his business. He’s the only guy in the lineup who just keeps on chugging along. Take a lesson. Take some extra batting practice. Stop reading your press releases and talk to Kevin Seitzer. If it were just a bad stretch, I wouldn’t be that concerned, but he has 25 K in 67 PA (37.3% of the time) and looks like he is helpless. @74 and most of that was with a sore wrist. Let’s have some perspective. It would seem like bringing in Wisler was a white flag move. AAA was no-hit in a rain-shortened game in the 8th inning. I just hope we don’t have a Jordan Schafer situation where dansby plays with the injured wrist and messes himself up for good. @74, Those are “maybe he is still injured” numbers. If a player is not sufficiently healthy to play, perhaps he should still be in rehab. If his health is adequate to perform but he does not or cannot, he should not burden the Braves starting lineup with his futility. Said player needs to perform or prepare to perform somewhere other than the big league level. This seems to be an either-or decision to me, but it’s not mine to make. The next week we get Sale, DeGrom, Syndegaard, Strasburg…yuck. Next post Red Sox 6, Braves 2 – Did Snit Confuse Winkler with Wisler?